The relationship between science and faith is really quite simple. Science is what we have discovered about the reality of our universe. Faith is what we have yet to learn. So far, mankind’s study of science has been limited to only learning about the reality of our physical universe. But our universe is not necessarily the only reality out there. There could very well be additional realities that have yet to be discovered. As humans continue to evolve, the human brain may one day reach a point where these additional realities can be studied and understood. Many believe that one of these additional realities is the reality of God. Mankind’s study of the physical universe, which we call science, began almost 150 thousand years ago when modern Homo sapiens first evolved and separated from their pre-human ancestors, such as Homo ergaster. Now, Homo ergaster was a pre-human ancestor that existed on the Earth for well over a million years prior to the appearance of Homo sapiens. Anthropologists have discovered that the technology of these pre-human Homo ergasters changed little over those million years of their existence. The reason for this appears to be that Homo ergaster had a significantly smaller brain than modern man. The continued evolution of the brain, with its ability to reason, is what set Homo sapiens apart from their pre-human ancestors. Now, the brain did not just suddenly get larger. The evolution to a larger brain occurred over thousands of years, and it still continues today. As a result, human discovery of their world and the resulting technological improvements began very slowly. It took thousands of years for Homo sapiens to make the change from hunter-gatherers to an agrarian society. Civilization, itself only began about 6,000 years ago. Mankind’s knowledge of their world seems to be growing exponentially. When we say something grows “exponentially”, it just means that the rate at which we discover new things is constantly increasing over time – just like an automobile accelerates over time from a stop sign. We see this exponential growth of knowledge in the fact that ancient mathematicians and scientists began to study our world 4000 years ago. But, the vast majority of what we know about our world today has been discovered in only the past 400 years. 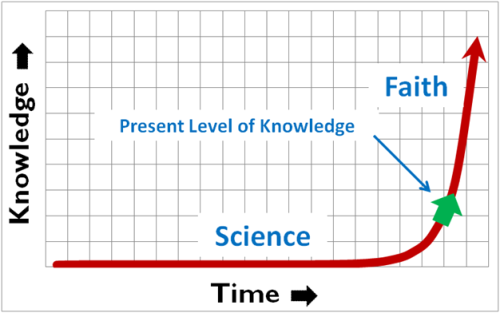 Mankind’s exponential growth of knowledge can be demonstrated as a curved line on a graph. The horizontal axis represents the passage of time and the vertical axis represents the knowledge mankind has gained about their universe. The line slopes upward to show that mankind’s acquisition of knowledge is accelerating as time passes. 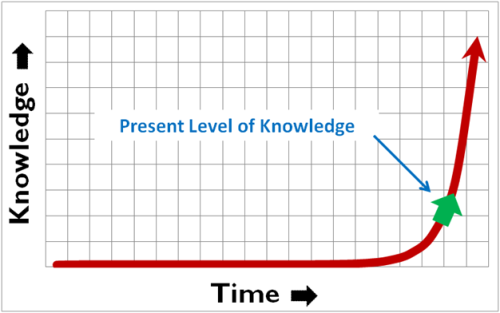 The left end of the line has a starting point around 150 thousand years ago, but the right end of the line has an arrow to show that this acquisition of knowledge will continue indefinitely into the future. As we said, the line starts at a point 150 thousand years ago when Homo sapiens first evolved on the Earth. At this point, they possessed very little knowledge about their physical world. As time passed and we moved to the right on our line, the discovery of new things and new technology was very slow at first. However, as the human brain continued to evolve, mankind’s acquisition of knowledge continued to accelerate. With the dawn of civilization, society could finally start supporting early thinkers who began to build the foundation of our scientific knowledge today. Ancient mathematicians began to recognize relationships in numbers, and ancient engineers began to learn how to build large structures. Then, starting in the seventeenth century, modern scientists began to unlock the mysteries of the universe. As we arrive at the present day, we can mark that point on our line as representing our current level of knowledge. The part of the line before the present day represents the sum total of knowledge mankind has acquired since the dawn of mankind. This part of the line represents our science. It should be noted that this segment only represents a finite distance along the line. The part of the line from where mankind currently exists and extending out into the future represents knowledge that mankind has yet to acquire. This part of the line represents our faith. It should be noted that this segment always represents an infinite distance. No matter how far mankind moves out along the line and acquires new additional knowledge, the total of mankind’s knowledge will always be finite and the amount of knowledge yet to be discovered will always be infinite. From this illustration of the curved line, we can see how our faith is an extension of our science into the future. This extension of our science can include things we have yet to prove about our physical world. For example, we believe that the universe was created as a result of some cosmic Big Bang, but our science does not yet allow us to prove this to be fact. The extension of our science into the future can also include a belief in other possible realities. For example, many philosophers believe that human consciousness is a reality separate from our physical world. Another distinct reality that forms the basis of many religions is the reality of God. A key point to always keep in mind is that, at no time, will mankind ever have complete knowledge of all realities. The sum of what we know through science is will always be finite, and what we must believe through our faith will always be infinite. Now, the religions of the world try to fill this faith area of our line with their own dogmas about God. But there is a problem when these dogmas are inflexible to new discoveries. Let us illustrate this by adding another point to our line. This point represents the location where mankind existed at the time a religion was established. When a religion is established, it builds upon the knowledge of mankind at that point in time. So, this new point on the line coincides with mankind’s knowledge at that point in history. I will use the Roman Catholic Church as an example, although any of the major religions can be used. When the Roman Catholic Church was established in the first centuries after Jesus walked the Earth, concepts such as the devil and the second class nature of women were commonplace. But, now let us move forward in time. While religions are not completely static in its beliefs, they are very slow in accepting new knowledge that mankind acquires. In our example of the curved line, our new point on the line will also begin to move to the right to represent that part of mankind’s knowledge that is accepted as true by the religion. While this point does move in the same direction as the point representing all of mankind’s knowledge, it does so at a much slower rate. Over time, the distance between these two points gets larger and larger as the religion’s acceptance of human knowledge lags farther and farther behind what mankind has actually learned. I will call this new segment of the line between these two points, the Religious Gap. An example of this religious gap occurred in the seventeenth century when Galileo spent the last years of his life under house arrest by order of the Roman Inquisition of the Roman Catholic Church. Galileo was a strong advocate of the work of Copernicus, who showed that the Earth revolved around the Sun, rather than vice-verse, as was previously believed. The Roman Catholic Church, however, found this concept to be contrary to the literal interpretation of sacred scripture and tried to force Galileo to recant his position. Today, the Roman Catholic Church accepts Copernicus’s heliocentric concept as proven fact, and the whole issue of Galileo has become an embarrassment in the annals of Church history. But even in the present day, there are many issues caused by the Roman Catholic Church’s failure to keep up with mankind’s knowledge. Birth control, stem cell research, women’s equality, as well as gay and lesbian marriages are just a few of the issues that fall within the area of the Religious Gap. When the Religious Gap was small in the early days of the Church, it was easy for people to accept the teachings of the Church since there was not much difference between what the Church stated to be true and what the people perceived to be true. 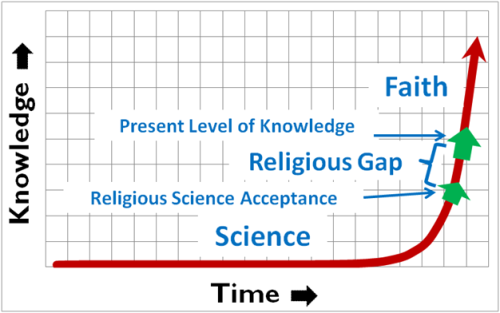 But, as the Religious Gap widened over time, it become less easy to accept these differences between religious dogma and the new discoveries of modern science. Conflicts began to arise between scientific fact and religious beliefs. For example, in science class, students are taught about evolution and how mankind evolved from lower life forms. In religious education, students are taught that God created mankind separate from the other animals. Both views cannot be true at the same time. As this Religious Gap continues to get wider, it becomes natural for some people to think that science is explaining everything, so what is the purpose of organized religions with its archaic concepts. When this happens, people begin to fall away from organized religions because all their frontal lobe reasoning tells them that science gives a much more believable picture of our world than that represented by sacred scripture and religious dogma. Now, this Religious Gap does not need to exist, or at least not be as wide as it is. Under the concepts of the Existential God, people are allowed to re-interpret religious teachings in a manner that makes more sense to them. People may also choose to re-invent the concept of God all together. The key point here is that science and your faith should work in harmony rather than being at odds with each other. One of the fundamental purposes of an Existential God is to allow one to accept both scientific discoveries and principles of faith as different parts of the same quest for knowledge. People should not be forced to choose between scientific knowledge and religious beliefs. Within the framework of an Existential God, when new scientific discoveries are made, people are free to adjust their personal Existential God to accept this new knowledge while still retaining their belief in God. As we talked in the first lecture, an Existential God is people exercising their freedom to come to their own unique understanding of God. Each individual’s personal Existential God will be different from every other person’s Existential God because we are all unique individuals. And, because we have each reasoned out our own personal belief in God, we will each live our lives more passionately according to our beliefs because they are our beliefs and not just some set of dogmas dictated to us by an organized religion.